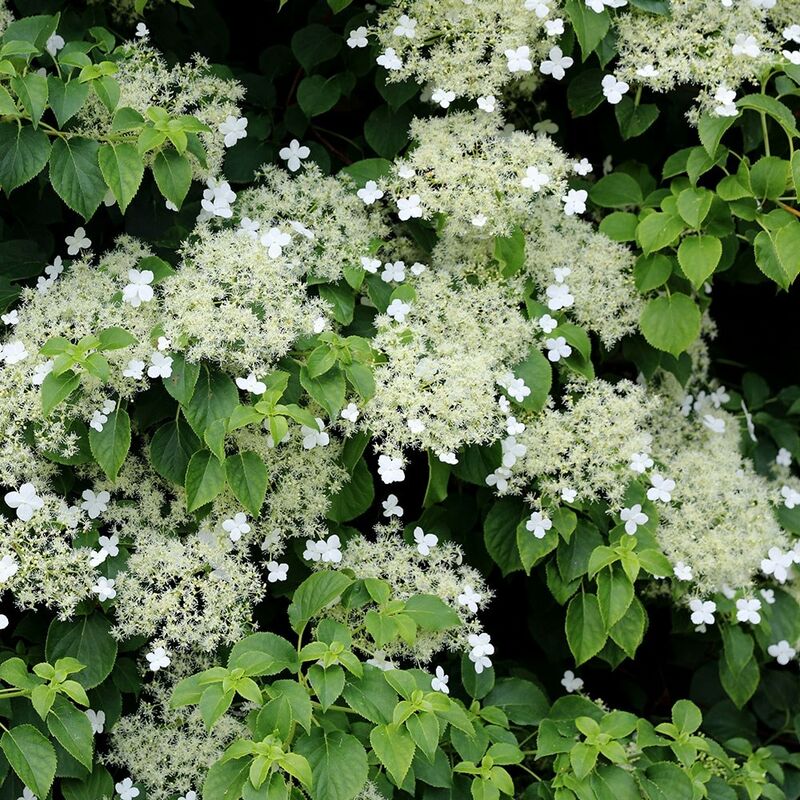 A star plant, this climbing Hydrangea thrives in some of the most shady, inhospitable areas of the garden. Slow to establish, it will eventually romp along a wall or fence, clinging by aerial roots. Its almost heart-shaped, dark green leaves turn yellow in autumn, and masses of showy, lacy, white flowerheads appear in late spring and early summer. Garden care: Plant in moist, fertile soil and do not allow the soil to dry out while the plant is getting established. This hydrangea flowers on the previous season’s wood, so if you need to prune it back, do so in late autumn or early spring, but be warned that drastic pruning may restrict flowering the following year. This was a small healthy plant when it arrived and it did well through it's first few months starting to send out shoots and clinging to the wall although it didn't flower the first year. I planted it on a north facing wall and it tripled in size through the year. It is now spring and the leaves are sprouting nice and healthy and i have flower buds too so i'm delighted! Would definitely recommend this plant to brighten up a dull north facing wall. Good sized plant & settling in well! Placed in a large decorative pot to grow up a boring, shaded wall - the plant arrived well packaged and as a decent height so it's taking very well & has grown rather a lot already! The climbing hydrangea died back upon planting but new buds have formed and are swelling ready for spring. Unfortunately it has been positioned in the path of the local foxes jumping over the fence so some branches were ripped off. I hope it will grow in size quick enough to not experience any more wildlife damage this coming season. I planted this in a raised bed to attract bees and insects and enjoy the flowers. It has been easy to care for and beautiful to look at. As usual my Crocus plant is very good. My hydrangea is in a pot on our terrace ready to train up a fence. I'm excited as this is it's first season. Hydrangea petiolaris was rather small. Unfortunately we had 2 very hot months in May and June which impacted the growth of this hydrangea so I will have to wait and see whether it grows this year. Yes I'd definitely buy this again. A great buy. Plant arrived looking very healthy and well packaged. It is doing very well despite two cold winters by the sea. When you get a young hydrangea petiolaris, you would expect it not to put on too much growth in the first year or two. This one I received was in absolute tip too condition and more than doubled in size in the first year it was in. Hi - My 2 climbing hydrangea plants have just arrived from Crocus! I was planning to plant them along a section of north-facing wooden fence, but I read in a forum today that this climber is not recommended for a fence because they eventually get too big and heavy and can pull it down! Although our fence is pretty sturdy, its obviously not as sturdy as the side of a house. I have no alternative place for these climbers and I'm worried I've made the wrong decision. Can you give me any advice or reassurance? Hello These can eventually grow to be large climbers, but this will take time as they are slow growing initially. You can prune them to restrict their growth in the late autumn or early spring, although this can reduce the amount of flowers you have the following year. Hi we planted this in a pot in June. Having read your advice we now wonder if we can replant it into the ground or if we should wait a couple of years. We also have clematis growing through it. Hello there Ideally these climbers are better grown in the ground, so I would transfer it into the garden this autumn. Hello, These are happiest in the ground, so would plant it out as soon as possible, as this will also give it a chance for its stems to fix to the supporting walls/fences. Can this be planted in a large planter, as opposed to a bed, and if so what size planter would you recommend please? Many thanks. Hello, This plant is not ideal for a pot as it does get pretty big in time and will prefer having its roots in the ground. I have a climbing Hydrangea on a north-west facing wall, our kitchen side wall on a terraced house. I was surprised to see in your response to a question from 2014 that you said this plant doesn't have a fragrance - ours has a stunning scent when in flower. 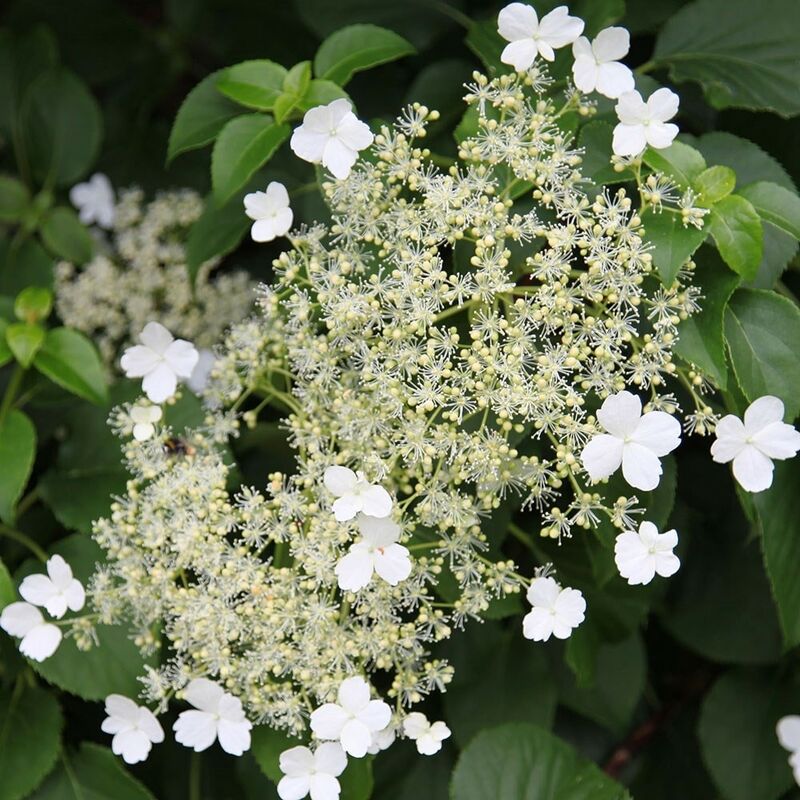 It's definitely this plant (well I don't know what subspecies but it looks exactly like the picture and I was always told it is a climbing hydrangea). However my question is about damage to brick pointing and to drains. The plant was here when we bought the house 8 years ago but was much smaller. Just in the last say 3 years it has insanely romped away. I cut it back as much as possible every year but it comes back vigorously (and contrary to your plant description, this does not impede it flowering!!). I'm considering removing it as I think it reduces the light coming in the kitchen windows, and I'm concerned about it possibly digging into the drain with its roots and damaging the brick pointing with aerial roots?? Please advise! Hello, I wonder if you are confusing this with a similar plant called Schizophragma hydrangeoides, which does have scented flowers. It does look very similar and it does have the common name of Japanese hydrangea vine - please click on the following link to go straight to it. http://www.crocus.co.uk/plants/_/schizophragma-hydrangeoides/classid.4374/ As for damaging the pointing/drains, it is difficult to say with any certainty as it will really depend on where your drains are and what state your pointing is in. If the pointing is sound and you have no intention of pulling it away from the wall, then it could actually offer some protection, but if the pointing is loose and flaky, then it may come away when stems are removed. They are pretty big plants though, so my advice would be that if it is too big for the spot, then you should probably with something that is better suited. Hello, It sounds as though it could do with some fertiliser, but I would be careful not to over-feed it at this stage as you do not want to encourage the plant to put on lots of fresh new growth before the frosts arrive. You could however apply a generous mulch around the base of the plant now, and then start feeding it with a good, general purpose fertiliser such as Vitax Q4 in spring next year. Hello, These plants are not overly fond of a short back and sides, but if it has to be done, then you can tackle it in early spring, ideally leaving a framework of branches. Hi I planted a climbing hydrangea about 4 months ago but, it doesn' seem to get aerial roots. It is not clinging to the wall. Is that because it is still a young plant? Hello, Yes, these do need time to start clinging to the wall - and the stems also need to be close to the wall before they develop aerial roots. 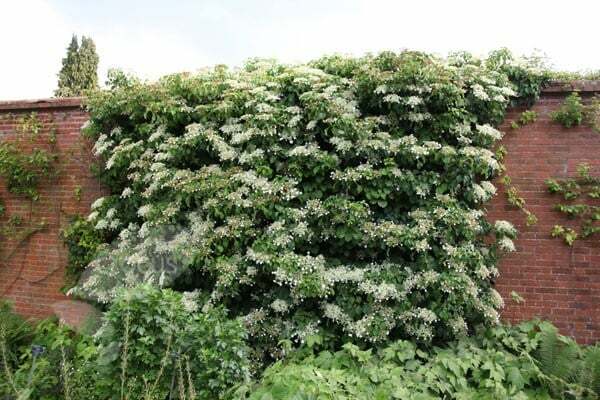 I wish to pair this climbing hydrangea on a north east facing fence panel (receives 2 - 4 hours sunlight) next to a matured Pyracantha Saphyr Orange shrub, will I need to install trellis onto the fence panel for the aerial roots to hold onto? Hello, You will need to offer some initial support, but once it gets going the aerial roots on the stems will cling to the fence without help. Hi,are these scented? I spotted what I thought was one of these at Chartwell House growing up several storeys and had a stunning scent like orange blossom. Is this the same plant? Thanks. Hydrangeas - which one to choose?